Bringing high quality production to the web-series world. 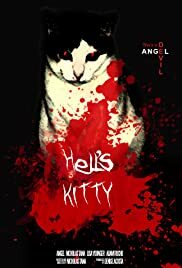 Hell's Kitty is an example of what can be done on an ultra low budget. It uses excellent animation and SFX combined with a mysterious story line. The comedy plays well against the horror. The episodes continue to get better with time. The celebrity guest appearances are a pleasant addition, along with top notch sound design and musical compositions. It will be interesting to see how the series develops with time. The series makes references both visually and throughout the story line to classic and even not so classic horror film. The locations are kept to a simple minimum and is still kept engaging by fun flashbacks and supernatural special effects. It's interesting to see how a real live cat seems to play to the camera so well. Her facial expressions make it seem as if she really knows what's being said about her. The added touch of the voice over from her perspective during the closing credits adds an interesting addition to the story. It will be interesting to see how the story develops and what guests are willing to lend their talents to what is proving to be a fun comedy horror production.